Will I make money overnight or in a few weeks with this product? NO. If you are looking for overnight riches DO NOT BUY THIS PRODUCT. On the other hand, if you are looking for a REAL business that is completely hands-off once setup and will earn you passive income - this is a complete game changer for you. Are you offering review copies? Yes. I am looking for about 10-12 people with over 100 posts to provide review copies to. Is this a written or video course? This is a complete video course inside of a secure member's area. Will the price stay at $27? How Do I Get Access to The Members Area Once I Order? After you order simply ping me here and let me know the email you used to purchase and I will setup your login credentials to the members area. Location: Maryland, and sometimes West VA , . I have some experience in the pay per call business, and I would love to review your WSO. Please let me know if you have any review copies left! Hi, are there any OTO's? I am very interested to review this product. PM me, thank you! No there are no OTO's. Have not received any PM from you. Delay in the system perhaps? Have you still not received my PM? I'm an experienced warrior, and always offer my unbiased opinion. PM me when you can, and thanks! Purchased this and the download leads back to the sales page? I have a couple questions about your pay per lead wso. 1- After someone has picked their and built their site as well used the seo tactics in your course is there any way to know how long it would take a site to rank in google or any of the other search engines? 2- Also, how much start up capital would be needed to launch this type of pay per lead business from someone who is new to this and never done it before? 3- On building out the sites what is your opinion of using host gator as a web host provider to do that with? I have purchased the offer and it leads to a jvzoo page to buy the same product I just purchased. The email from paypal links to the same page. Sorry, just working out the kinks with a new membership platform so I'll be adding people manually for now...will be sending your login details over via PM shortly. Adding people manually until I get things sorted. Check your PM shortly for login details. I love lead gen stuff and would be happy to review your wso. I'll be honest, so as long as you've brought the goods, I'll say so. This is one of my favorite subjects. You missed my questions up above that I had regarding your course. I just received access to this WSO course but wanted to provide some quick feedback, for those interested. OK so even though I haven't implemented a lot of the tactics in this WSO, I am VERY impressed with the quality of the material, presentation and organization. This seems like a very complete course and just by quickly going over the contents it is immediately clear that this will work for both those getting started with little online marketing experience and also for those more experienced like me. The methods are great, original and can have many applications for those with some marketing creativity. I can see myself getting some results in 12 hours or less. Anthony Mamcuso is a very experienced marketer and I think he has summarized a great deal of knowledge in this great course. In my opinion, this is underpriced, so get it NOW! But that's not what matters, the important thing is that not matter how much you pay, you will learn a lot and will expand your current marketing campaigns with these original marketing tactics. I would like a review copy if it is still available. Have been interested in PPL Business for sometime but did not have the opportunity to look into it. I would write a thorough review for you. Disclaimer: I did receive a review copy. Hopefully you find that my review below is honest and reflective of this product. I don't take this lightly and you can read my history and know that I'll tell it like it is. Heck, some people come to me just to ask my opinion, so I do try to be objective and I'm not just some guy that goes around begging for review copies of any and every wso that comes out. I hate that. Alright, so let's get down to it. First I'm going to admit off the bat that I've only been through 80% of the course because it is massive and detailed. I wanted to get this out here though because I know people will have questions and I think he's only got this on sale for a few days. If I hated it I'd be here quick to warn you, and in this case I'm really liking this so I'm hear to tell you that too. It's only fair. I have purchased other WSO's on this same subject in the past. The types of niches that he goes after are exactly what I know myself personally, and at one point years ago I had a lead gen site in this realm that produced leads and I had no clue what I was doing, lol. I had purchased courses that gave me about 50-60% of the information I would need to make it work and I improvised on my own and even then I was able to pull some leads in that I gave to a friend of mine that had a business for free just to prove the model. So this is totally legitimate. No course that I purchased comes even close to this one. This guy shows you step by step while he creates this campaign on his own. One thing I like is that he never just shows you one way to do something, he shows you several. Yes, that can get monotonous if you know some of this already, but I learned a lot of new techniques and some things that I formerly used that have gone away are no problem because he's provided several others. 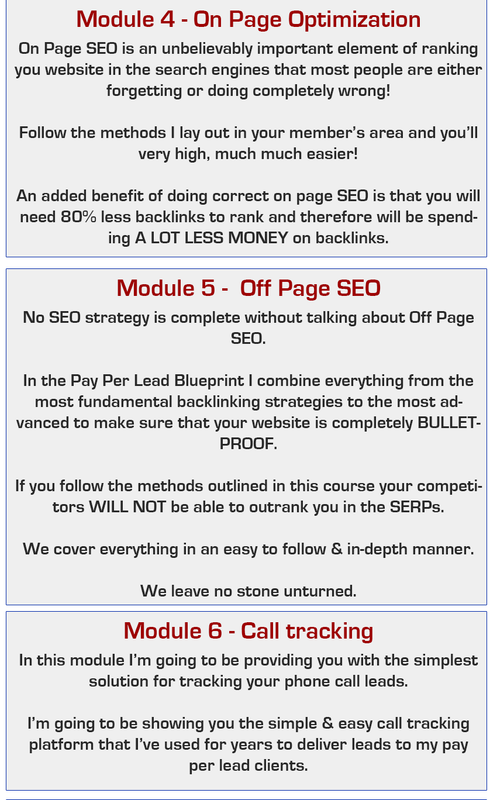 In the end this course is showing you basics (in some cases maybe more than basics) in everything from keyword research to web design to SEO to sales and marketing. It is as complete a course as I've found on anything and I'm not even done yet. I just have to go to bed and get some sleep. I've already got PAGES of notes from this. 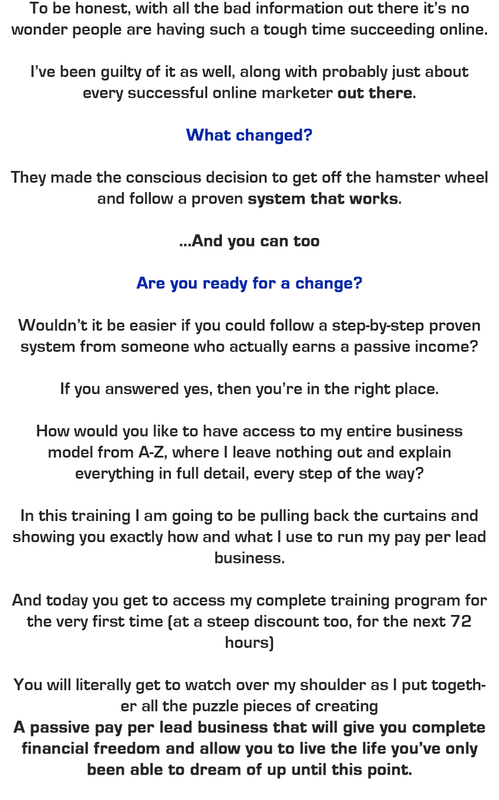 In reality, although this is touted as passive income, it is still going to take work to set up, but if you can follow instructions he literally shows you how to do pretty much everything. There is no such thing as a free lunch, there's always a price to pay. Speaking of price, if you do all of the things he recommends you'll be buying some services to help promote your site. It is going to either cost money or you're going to have to write content and press releases and such by yourself. That's up to you. Still, he has resources provided for things that aren't exorbitant. Again, in showing my honesty, although I love this course, I do have to mention that a few things here are pretty greyhat, as he was open about from the start. Let's face it, if you're going to set up a site that generates leads and pretend that you have a business in that field you're going to have to make up some things to fit the industry. That's just fact. How comfortable you individually will be depends on you. Let's face it, a lot of marketing is spin and accentuating the positive about things. You can use tricks to get verified for Google listings. In the past I didn't approve of such tactics personally, but now I'm not so sure. It is what it is. Let's face it though, it's not like that's the crux of this course. It is only one aspects. Overall this is hands down the most complete course in lead generations websites that I've personally seen. It is delivered well and he explains things as he goes along. There are resources and multiples ways shown to do things. Oh, and it does you no good to generate leads if you can't sell them and he even covers many ways of going about selling them with tried and true tactics and targeting. If you're truly interested in this model I would recommend buying this course. I don't say that to kiss anyone's backside, this is legitimately good. Even if you don't do lead gen there are some resources in here that I've never heard of that could be used in a variety of sales and marketing programs. 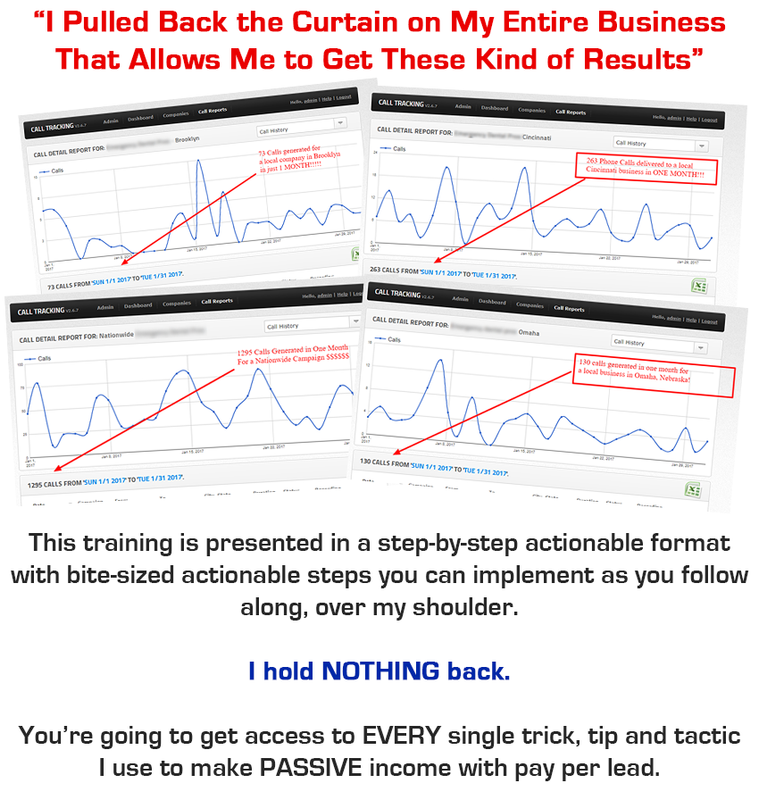 He even shows how to get leads before your site even ranks using a method that definitely works. I've used the method for my own offline service business in the distant past. Nice work Anthony! I've paid much more for much less on here before. You've put together something that can truly help those that are willing to hustle to put these things together. I have a niche that I know well that I may go after just because I got this today. I'm glad I happened upon this earlier while taking a break from my daily work. 1) It's impossible to say for sure how long to rank, the best answer is 3-6 months for most things (that I teach to go after) and 6-12/months for some heavy competition. Just like everything else though the only way to REALLY know is get experience and then you develop that 'gut' feeling. 2) The beautiful thing is you don't NEED a big investment up front. The amount of money you'll need to invest...it's not the answer your're looking for but....it depends. It depends on the competition you choose to go after. Medium (GOOD Money) competition I'd say about $400-500 on average. But that doesn't have to be all at once that can be over a period of time. Just know that once you get these sites to rank you be earning 2x3 that per month - for a long, long time. 3) I have many sites with hostgator, it's fine. Thank you so much for your kind words about my course, I've put a lot of work into it so it's much appreciated =). Umc, wow! Thank you so much for your review and I'm very glad that you loved my product. I also want to mention that this product is ONLY in beta right now so there are still things that will be added =). Also, anyone who buys now during the early bird locks in at the one-time price and will receive updates automatically. This will go away after awhile and will become a monthly addon. With that said, there are MANY more strategies that will be added but this is the CORE and all you really need, other stuff get's alot more advanced. I do just want to make sure I touch on what you said about the google maps verification and you are 100% correct, it is greyhat. I want to stress that this is NOT necessary for most people. 90% of my websites that are ranking and earning me income consistently each month are doing so WITHOUT a verified maps listing. For that reason I actually debated even not having it in there and I may take it out depending on feeback. Umc thanks again for your review! I have sent you over access via PM. Can you please confirm you've received =). I've sent you access via PM. Excited to go through it, and will offer my unbiased review soon. I have received the login information. Thank you so much for the review copy! Will go through the materials and leave you a review as promised. The course is exactly what the OP promises – a 100% Complete Biz in a box. I spent about 3-4 hours to finish the whole video course. Anthony takes you by the hand to show you the A-Z on generating leads for different businesses. His voice is loud and clear. The way of presenting the course is very direct, not beating about the bush and wasting your time. All these qualities make the course quite enjoyable. From his in-depth discussion on each module (some modules have 40-50mins of videos), you can see that this is someone who has actually implemented the methods he is teaching and made real money from it, not the normal rehash WSO out there. Anthony suggested a website and a very broad niche to get niche and sub-niche ideas. 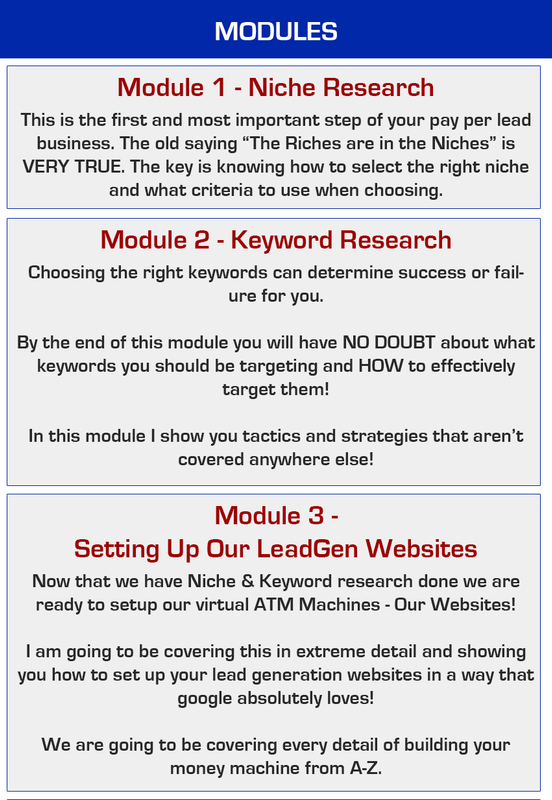 There are so many niches in different locations from the website that if you do your niche research properly as Anthony has done, it is impossible not to find at least a few golden nuggets! Anthony shows the 2 websites (free) and 2 software (paid) that he personally uses for keyword research. He strongly recommends the 1st software which he feels is essential to your business while the 2nd one is optional. Insider’s secret is revealed here – how much search volume is required to choose the keywords and whether the search volume shown by the websites are reflective of the actual amount of searches in google. This is priceless. Lastly, competition from established websites in the niche is analysed carefully before deciding if the niche is worth a go. This module is about setting up wordpress websites. Intermediate and advance marketers should be familiar with the process and can skim through just the last few videos to know what WP plugins is used and the type of pages Anthony setups for his Lead Generation websites. Anthony actually bought a domain for illustration purpose in this module. He presents his way of writing the SEO title and H1 tag for the main domain and subdomains. The SEO title will be changed after the site has been ranked in Google. Setting up the navigation menu correctly, writing the contents and getting images for the site are also discussed in details. You need to spend some money to implement this module. Several great sites providing great backlinks and other services at good prices are revealed. We need a call tracking system to route the phone number to whichever business we are sending the phone to. Anthony recommended the call tracking service he used. A site is introduced to get people from the city of our lend generation site to search for your brand in google effortlessly, leading to quick improvement in rankings only if it is used in conjunction with Off Page SEO methods taught. There are 3 ways to sell your leads – voicemail, traditional email and non-traditional email. The contact numbers of your targeted companies listed in websites (where you sell leads to them) may be redirected numbers. 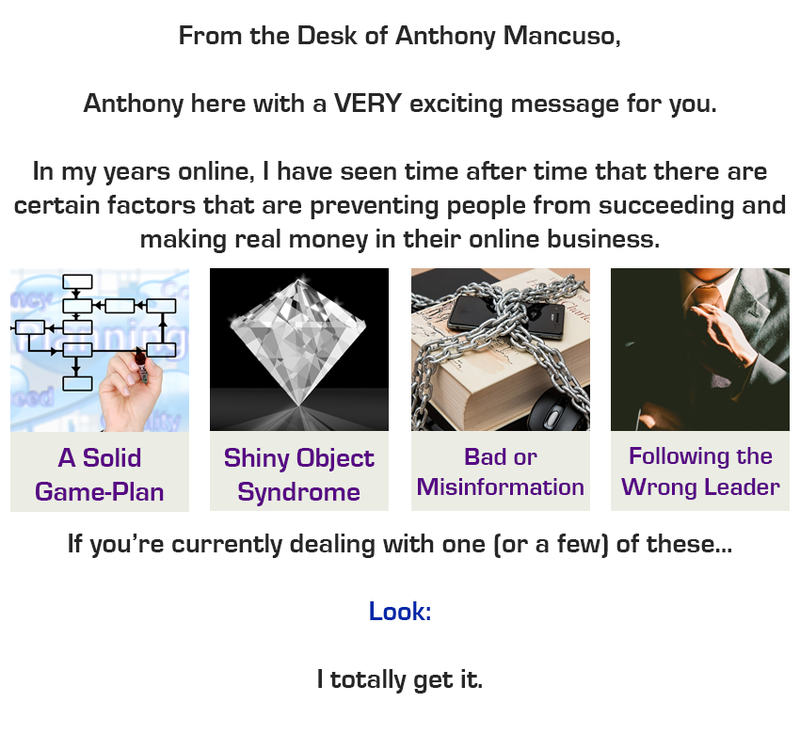 Anthony shows you how to get their real numbers – priceless! Pay Per Call programs are also introduced when you started to get websites ranked and generate a few leads which is not enough to sell directly to the targeted companies. Niches that do well with craigslist and the powerful posting techniques that can get as many as 40-60 phone calls monthly are revealed! Module give away the sneaky method to get Google Map listing verified for a dime comparatively without having an address in the location. Again, Priceless! Overall, this is an excellent course at a great price with many insider’s information totally revealed. If you are looking to generate leads by setting up websites, this is the COURSE FOR YOU! Do note that you need to have at least a few hundred bucks for investment to setup each website. After you have taken massive actions and done your work, you need to stay patient - wait a few months for the sites to get ranked as Anthony has honestly said in the FAQ section. The fruits of huge passive income later on would more than make up for the initial hardship. I would give this course a 9.5/10 rating. -	Templates mentioned in videos not available yet. -	A few videos have poorer sound quality but still audible. -	It would be better to buy the screen recorder software for the videos to be without the brand’s watermark, making the videos more professional. Thank you for your review copy and all the best for your WSO, Anthony! Interested in review copy if still available. Wow! Thanks John for your awesome review. The last bit about buying the software so the watermark wouldn't be there - I cant believe I forgot this step! Ugghh! Resource links and templates will be available soon for all members. do you have any Done For You service? Hi, did I understand correctly that you are looking for people with over 12 posts to offer review copies to? I received a review copy. I would like to reiterate what has been said by previous reviewers. This is a really newbie friendly WSO. If you are looking to get into PPCall this WSO is a good place to start. Nice tip on how to verify the Google Places Listings. I would consider this a creative way to getting the job done rather than greyhat. I'm struggling to add anything to this review that has not already been said by previous reviewers. This is a good course, which is well presented by a guy who is clearly doing what he is teaching. For $27 it is a bargain given the amount of content in the course. 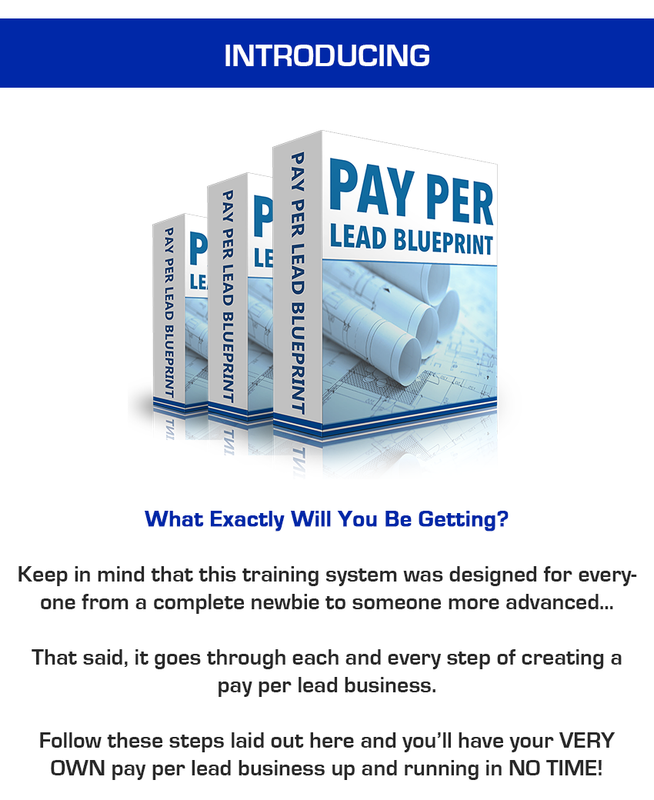 If you are looking to get into local lead gen and/PPCall this is a good grounding and I would highly recommend this course. Thanks for your review. That means a lot coming from someone in the PPCall leadgen industry themselves. Much appreciated! 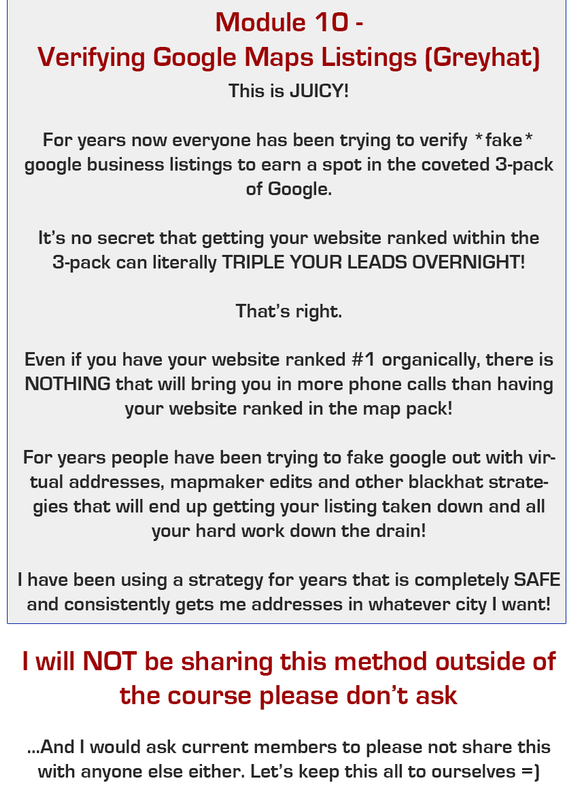 I also agree with you on the verifying google listings method I teach not really being greyhat but creative - I just had to put that there for the inevitable haters or people that live to bring these type of things up! yeah this product is not for you...I don't know any genuine online business that doesn't take work upfront. This is for people that are WILLING to put in a little bit of work upfront, initially, to then have virtual real estate that generates them money consistently every single month. Once you have it up & running it is just about as passive as you can possibly get...but it DOES take work up front. Sadly the reason most people fail online is this kind of attitude that they don't want to put in any kind of work, so they get suckered into these "make a million dollars overnight" hype programs that don't work and then judge the whole industry on it. I received a review copy and just finished watching all the videos. I must say that this is the best course i have seen & i have bought well over 50+ courses online. Each module is explained in depth. If you follow the steps, you will succeed. I personally loved this "Module 10 – Verifying Google Maps Listing (Greyhat)" This module alone is worth the price of a product. Its very rare to be learning from a guy who not only has a product but who also makes money using same methods explained in product. Thanks a lot for such in-depth training. I myself learned a lot from it. sent payment.....need my login credentials. Ok, got the review copy. He shows a way where you can have people contacting you to buy your leads and a way to send your leads somewhere and get paid without having to actually make any partnerships with businesses which I think is really cool. I actually just fell into this technique. 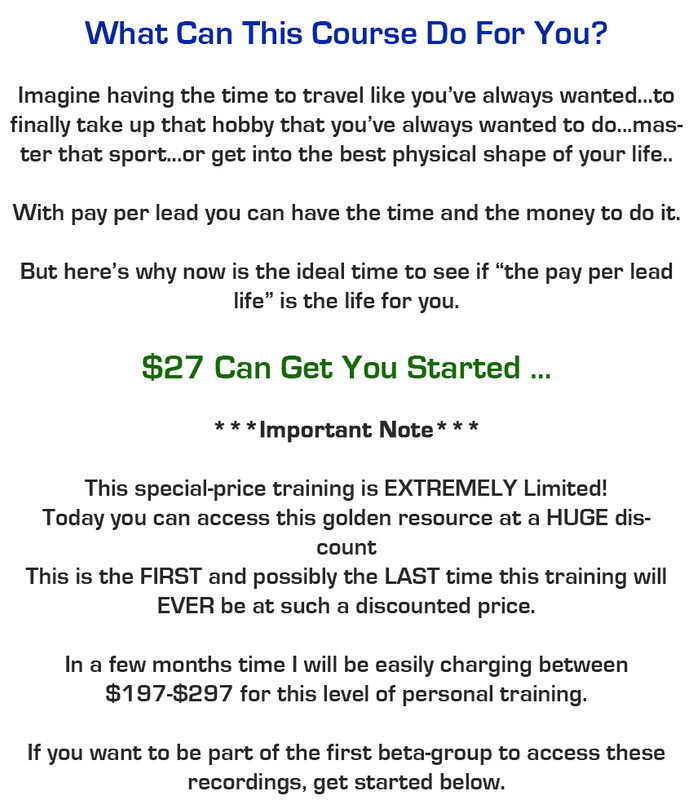 (The one where people calling you are only people who are qualified and about ready to buy leads from you) He also shows a solid way to get your leads.I've studied pay per lead business before. However, one kind of lead I'd like to get that I haven't been able to get is for people wanting to buy physical products. The value I got from what he shared was definitely worth $27 or whatever it is going for. Especially because of some of the technology he shares and ways to avoid having your time taken up by unqualified calls is something I recently discovered, but is highly valuable if you are serious in business at all. Lastly, I'd just say, this is a real business, so I would mainly recommend it if you are trying to either improve an unrelated business, because things he shares could help any business, OR if you are really getting into the lead gen business and realize this is something you work on every day long term with patience like you would with starting up a floral business or any business. Wish you the very very best and thanks Cuso for the review copy, I found it really valuable and encouraging.